On any given day, a casual browse of the Total War subreddit (or forums) will generally reveal more threads, shitposting, and indicators of interest in Total War: Warhammer than in the series’ traditional historical fare. We saw this in the lead-up to the spin-off ‘Saga’ game, Thrones of Britannia, and there may be some risk of the same happening with Total War: Three Kingdoms. I can relate. For a while, it just wasn’t clicking for me. I don’t know the history of the era as well as I do that of Rome or Thrones of Britannia, and nor – to my shame – have I read Romance of the Three Kingdoms. I haven’t even seen Red Cliff, the John Woo film dramatising one of the early battles in the Three Kingdoms conflict. But that’s all changed since I played the first 30 turns of Liu Bei’s campaign, and I’d like to tell you why. 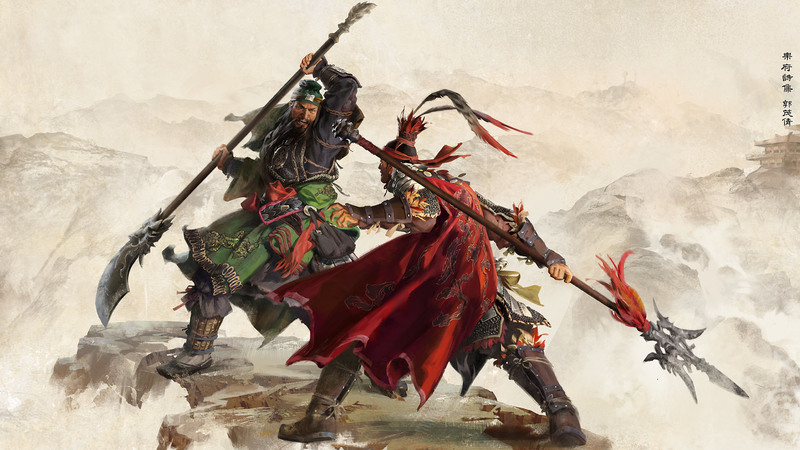 You can read my preview of the campaign for my full thoughts on Three Kingdoms, but for now, here are five reasons the campaign in Total War: Three Kingdoms has finally kindled a little excitement in me. If you’ve been following Three Kingdoms you’ve probably noticed this already. But just to confirm: this is a sickeningly good-looking game. Unlike the flat, old Attila engine used in Thrones of Britannia, Three Kingdoms’ campaign map pops. That’s also true for Total War: Warhammer, but Three Kingdoms feels warmer thanks to new lighting tweaks – most obvious in the day/night cycle. There are wonderful touches throughout the game, like the way traders on the map take out tiny lanterns to light their way through the dark. Three Kingdoms is pretty at every level – even the UI looks good, arranged around lovely flowing ink effects. CA tells me the studio spent weeks in pre-production, mixing ink in different consistencies, and filming how it flowed to create their own custom shaders. 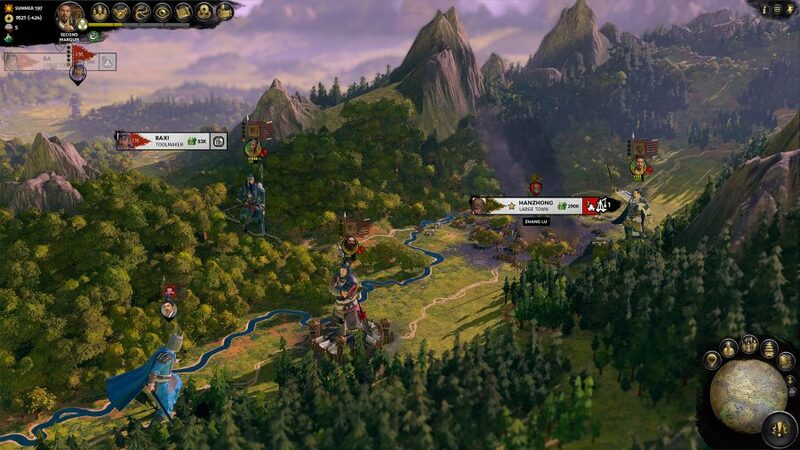 The Warhammer games look good, but Three Kingdoms is setting a new bar for delighting the eye. Warhammer III has a lot to live up to. Creative Assembly has said from the start that Three Kingdoms is all about the characters, and to my shame, I don’t know who they are. The game’s major source is Romance of the Three Kingdoms, a novelised retelling of Chinese history that features more than 1,000 characters. It looks like Total War is going to do a pretty great job of retelling the story once more. Fei is one of Liu Bei’s two sworn generals, and after 30 turns on the road with the boys I feel like I know them. Each campaign also has an initial dilemma – a crucial choice drawn directly from the novel. Liu Bei’s is whether to support Tao Qian against the devious Cao Cao, and it’s a tricky one, because the latter is a fair bit more powerful. 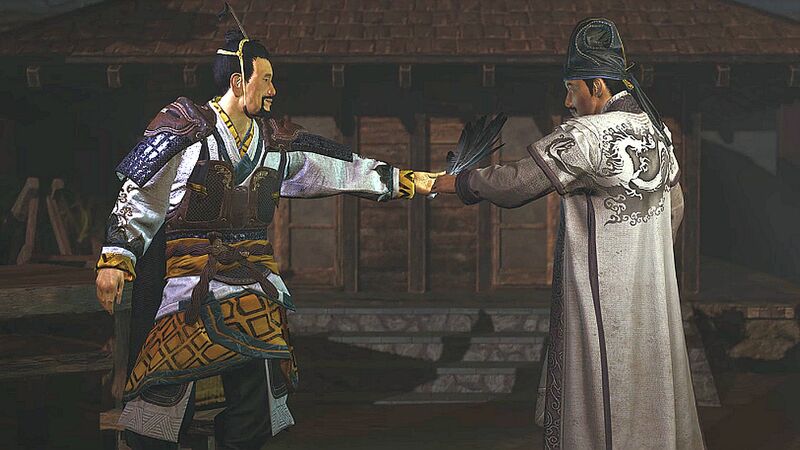 If all the characters and their dilemmas are as well-drawn as Liu Bei’s, I’ll want to play through the campaign several times to see the conflict unfold in different ways and from different perspectives. When CA says characters are everything, it doesn’t just mean in the story. Characters have changed mechanically: they all have opinions of one another, they can move around independently on the campaign map now, and most importantly, they’re no longer permanently attached to factions. They can up and leave you if their satisfaction drops too low, and then join a rival. If they’re competent they might get a position, and maybe even take over the whole faction if the previous leader should die. That kind of leadership change can completely screw your relations with another faction, if the previous guy liked you but the successor doesn’t. Now consider what might be possible if the skilled general who leaves you and becomes a minister in a rival faction is actually your loyal spy. Add to this the more familiar quirks of a Total War character system: characters can die and must assure their dynasty by marrying and producing an heir. Their skills in battle and diplomacy are also defined by the usual bundle of attributes, skills, traits, and equipment, so plenty of depth has been added, and none has been lost. Wu Xing is a conceptual scheme of five elements under which the people of Three Kingdoms China sought to explain almost everything. 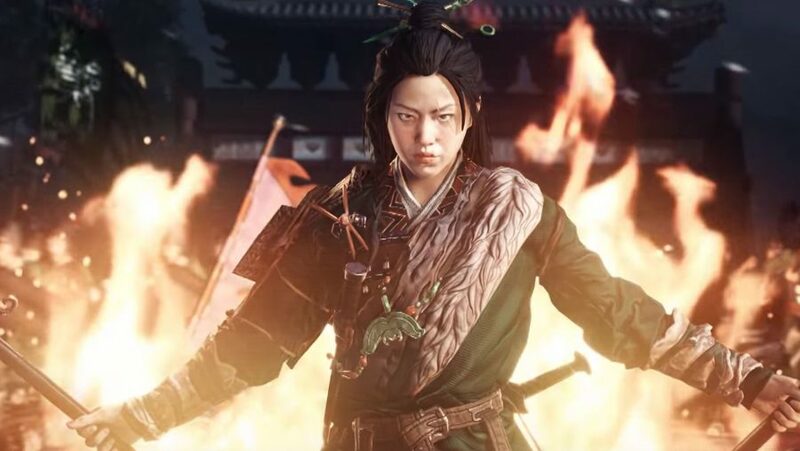 Total War: Three Kingdoms will similarly categorise phenomena at every level of the game into the five elements – its traditional rock-paper-scissors unit balancing is an easy fit, but the idea goes way further, even into the realm of the metaphysical. What if your skilled general who joins a rival faction is actually your loyal spy? Shock cavalry, Vanguard characters, the Instinct character attribute, and military buildings – they’re all linked by Fire, and will have a splash of red colouring to indicate as such. Some will be obvious – Instinct is red in the UI, for instance – while others will be subtle. Vanguards will wear red clothes, and military buildings will have red roofs. 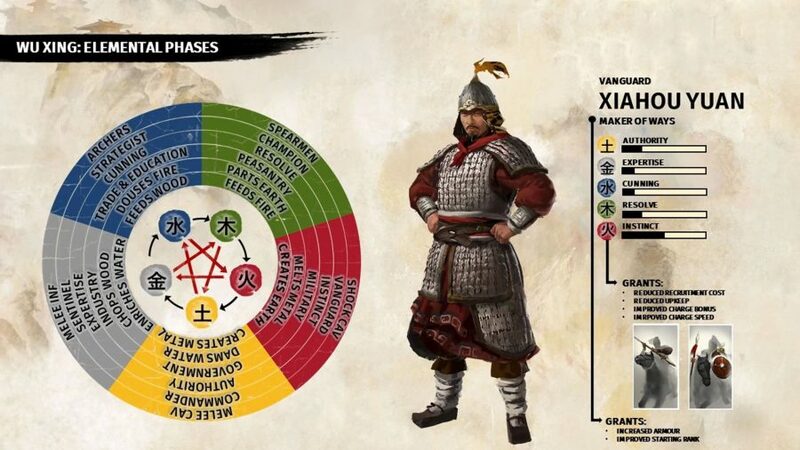 This system serves as a visual language to introduce new players to the complexities of Total War, but it’s also an elegant commitment to the culture of the Three Kingdoms, and even though I might not get much out of it in practical terms, I’m curious to see just how deep it runs. I enjoy Total War’s battles, but I enjoy the campaign even more. It’s partly the sense of escalation – you plan, you strategise, and your reward is to see your empire spread across the map, like a ripple in the ocean that becomes a tsunami. Three Kingdoms will lean into this journey even more with a new currency – Prestige – which will track your climb through Chinese aristocracy. You start as a minor noble, and as you gain Prestige by capturing or upgrading settlements, can claim titles such as Marquis, Duke, and King. Of course, at the very top of the Prestige ladder is Emperor, and earning the right to proclaim yourself such is the campaign’s ultimate goal. When you do so, the next two biggest factions will follow suit, and you’ll be locked into a three-way war to decide the one true Emperor, regardless of your previous diplomatic relations. Certain logistical capacities that you might have taken for granted in previous Total Wars are also locked to your Prestige rank, which will either be annoying or a cool way to see your faction’s growing influence have a real impact on the world. The number of armies, spies, and trade routes you can maintain are all limited at lower ranks, though there is some leeway through the new tech tree, which has been renamed Reforms and is depicted as a literal tree. Cherry blossom bursts on each node whenever you’ve researched it. Which returns me to my first point. Gosh, this game is pretty. And there we are, five reasons I’m stoked for Three Kingdoms. Obviously I’ve only had 30 turns with the game so I want to stress this isn’t a full review – though do come back nearer the game’s release date of March 7 and we’ll have one for you then. Hopefully this has given you some cause to take an interest if, like me, you’ve been a little sceptical so far.